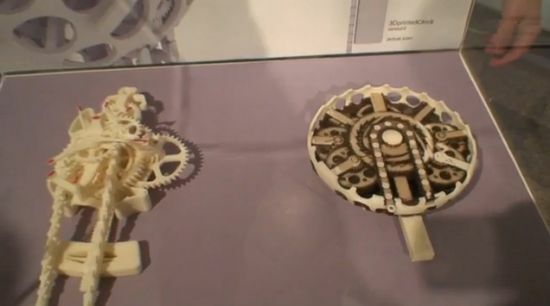 Peter Schmitt, at the Ars Electronica/MIT Media Lab exhibit in Linz, presented two prototype 3D printed clocks that he hopes will soon hit reality. 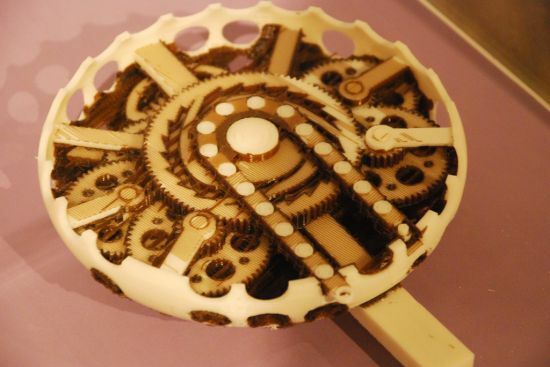 The development of the 3D printed clocks (check the video after the jump) is quite impressive in itself. The nice thing is that the clock will be printed in one go. It will have hands, pendulum, weight and the chains that create the periodic clock cycle. In short, everything what a clock weâre accustomed to has. By putting all of that together, in an enclosed support material, the clock will then be printed in one go. The goal is that it comes out of the machine, youâll remove the support material, put it on the wall, start the pendulum and it starts ticking.